PRESQUE ISLE—The University of Maine at Presque Isle’s Bachelor of Social Work Program is hosting the Mwika Musicians, a delegation from Tanzania, this fall for the international cultural exchange of a lifetime. Twelve student musicians from Stefano Moshi Memorial University College in Mwika, Tanzania, their choral director, and the college’s principal will be visiting Maine for two weeks to share their culture and traditions, experience the culture and music in the U.S., and build upon existing collaborations between UMPI and the Tanzanian college. The group will fly from Kilimanjaro to Boston, spend a week at UMPI between Sept. 20 and 26 visiting local classrooms and teaching various community groups about their traditional music and dance, and then travel to Orono and spend Sept. 26 to Oct. 2 at the University of Maine, hosted by UMaine’s International Student and Scholar Services, to conduct similar cultural exchange activities there. The group will have the chance to visit other spots in Maine, including the Maine State House and Maine State Museum in Augusta, before flying back to Kilimanjaro. During their visit in Presque Isle, the group will connect with the community in many different ways. They will have the opportunity to visit with several UMPI classes, drum with Micmac drummers, do a library lunch event at Northern Maine Community College, and observe music education activities and teach students Tanzanian song and dance at Fort Fairfield Middle High School. Also during their visit, a special reception and cultural exchange event for the group, titled Mwika Musicians: Community, Friendship and Hope, will be held. The public is encouraged to save the date for this special event, which takes place at 7 p.m. on Friday, Sept. 25 in the Campus Center’s Multi-Purpose Room. During this reception, delegation members will demonstrate traditional Afrikan music through song and dance, and share their culture through stories. 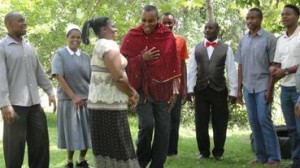 The music is in Kiswahili and is arranged to reflect the group’s Christian faith (Stefano Moshi is a Lutheran college). This event is free and open to the public and donations will be accepted. The delegation’s visit is one of the most ambitious undertakings Rush has helped to organize as a result of her University of Maine System Trustee Professorship that she completed in Tanzania in Fall 2013. The purpose of her professorship was to teach on the campuses of Stefano Moshi Memorial University College and work to develop the infrastructure and relationships needed for a reciprocal international exchange effort. That work has resulted in UMPI students traveling to Tanzania to complete coursework, service learning and clinical rotations. To ensure the exchange is reciprocal, though, Rush has been working to bring the Tanzanian musicians to Presque Isle. “I have seen the transformative effect of international exchange on my students at UMPI and it is powerful,” Rush said. One of the courses Rush taught while in Tanzania was a communications class and 12 of the students in that class were singers and musicians. Rush asked the group to sing for her, and when they did, she said she knew she had to find a way to bring them to the U.S. Rush and others have been working for 18 months to plan for the visit, make arrangements, line up passports and visas, and see to the hundreds of other details to make an exchange event like this happen. While fundraising has been done to cover the costs of passports and visas, ground transportation to and from Boston, and other expenses, community and individual donations are much needed to cover $20,000 in airfare for this group to travel to the U.S. and back. Rush and UMPI Social Work students are working hard this summer to help raise funds at local festivals and fairs. Rush also is working to raise funds through a Mamas, Sisters and Friends fundraising circle. For more information about the Mwika Musicians’ visit, to make a donation or to join the fundraising circle, please contact Rush at 207-768-9427 or shirley.rush@maine.edu. Donations also can be sent directly to UMPI, c/o Shirley Rush-Mwika Musicians, 181 Main St., Presque Isle, ME 04769. Updates about the visit can be found at www.facebook.com/MwikaMusicians.